After the first day of the Consultative Committee’s 7th Meeting had drawn to a close, participants returned to their hotels before heading to downtown St. Petersburg and the University of South Florida Bayboro campus. 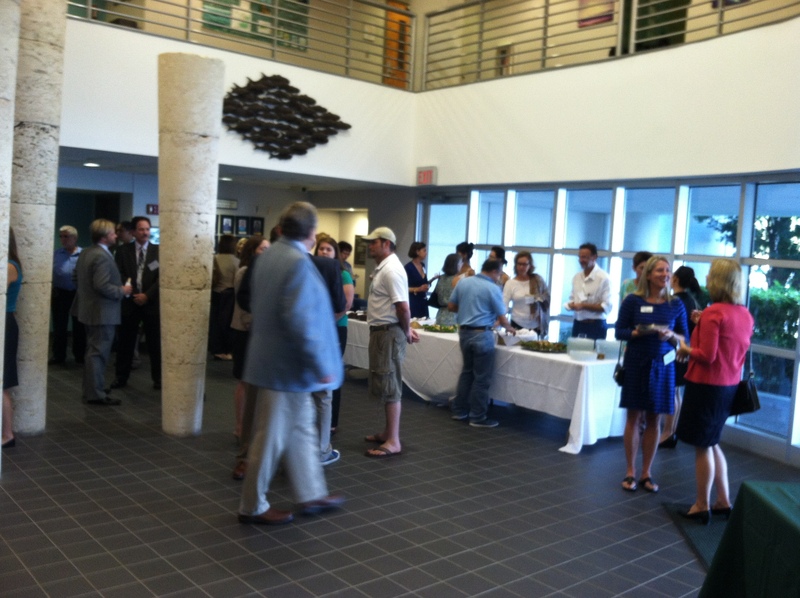 There, in the lobby of the Bill Young building, Stetson and other community members welcomed the Committee members to Tampa Bay with assorted beverages and catered local food. The city’s hospitality was well demonstrated as the Committee members from over a dozen countries and various organizations mingled with representatives from our community. 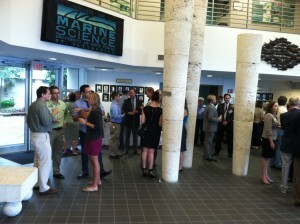 The reception included members of St. Petersburg’s Ocean Team, researchers of the Oceanographic Institute, faculty of USF, Stetson representatives, and delegates from the Sustany® foundation. These people, and other supporters of sustainability and the proposal to host the treaty, warmly welcomed those on the Sea Turtle Secretariat Committee. 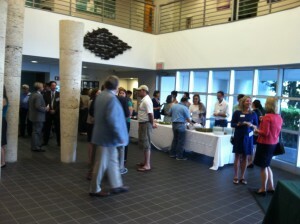 Discussions, conducted in Spanish, English, and sometimes a little of both, filled the building’s lobby about everything from hometown lives in South America to the latest sea turtle research initiatives. Dean William Hogarth, the director of the Florida Institute of Oceanography, officially started the event with a welcome address. In his self-proclaimed “Virginia-mumble” he greeted the visitors and asked that they carefully consider the advantages of hosting an international treaty here in the Tampa Bay area. He explained that the Bayboro Marine Research Cluster is continually seeking to expand in ways positively impacting marine research and policy and that members of the research cluster supported the Secretariat and Convention. St. Petersburg mayor Rick Kriseman followed Dean Hogarth in offering the city’s hospitality to all the countries representatives. A graduate of Stetson law school, mayor Kriseman was pleased to greet the Committee. He asked that they explore St. Petersburg and the rest of Tampa Bay beyond Stetson as a viable possibility for the future. His speech reinforced that our local area is becoming ever more supportive and attractive to international visitors and is continuing to promote growth in science, the arts, and sustainable efforts. Later in the evening, the Convention Secretariat (Pro-Tempore) Ms. Caceres thanked everyone present for the gracious reception and the invitation to explore the Tampa Bay area. She expressed her gratitude for Stetson’s kind accommodations and her appreciation for the community’s support for the Convention. Walking amongst the visitors, this was echoed by many of the members who were seeing the Tampa Bay area for the first time. 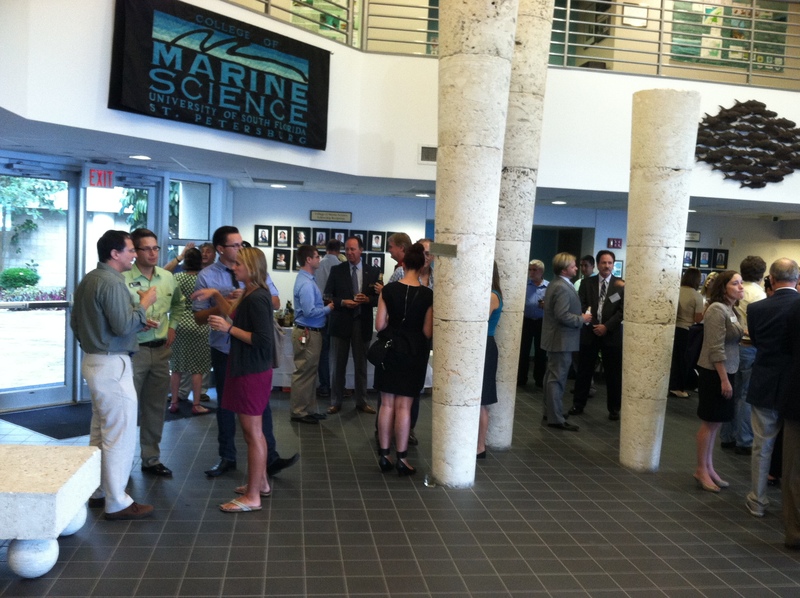 The evening’s warm reception showcased the St. Petersburg marine community’s enthusiasm as a potential host for the Sea Turtle Secretariat. After the reception, the members of the Committee spent their evening with Stetson hosts, walking along Parkshore Drive and experiencing a taste of life in St. Petersburg. Dali Museum director, Dr. Hank Hine, encouraged the visitors at the reception to sample the city’s vibrant art scene with a visit to the Dali Museum the following day, and delightfully many did.